Convince & Convert is all about hype-free social media. Practical, achievable advice you can put into place in your company or organization today. To that end we’ve developed a series of free social media worksheets that you can use to help keep elements of your social media program on track. We’ll keep adding these worksheets as they’re created. If you have any questions about the worksheets or how to use them, please holler. What’s your Facebook program worth to your company? Look at it based on what your email program costs you. Download this spreadsheet to make the necessary calculations. Social media isn’t a conversation, it’s where the conversation takes place. Go beyond chasing shiny objects, and build a logical, sustainable social media strategy that focuses on measurable business objectives – not Twitter followers. This Social Media Strategic Plan Worksheet is in use all across the country by companies looking to add some rhyme and reason to their social media initiatives. It’s best explained by my blog post and presentation on Creating a Social Media Strategy in 7 Steps. Before you go jumping into the social media water, shouldn’t you know what’s being said about your company, your products, and your competitors on the social Web? There are tons of great software tools out there that can help you monitor the social media conversation (I recommend Radian6, Spiral16 and ScoutLabs. Also, Collective Intellect if you’re a very big company). But sometimes, you don’t have the money for paid software, or you just want to get a quick peek at the scenario. That’s where the Share of Voice and Sentiment Worksheet helps. Using free tools, you can determine in just a few minutes where you stand in social media. This worksheet is accompanied by the How to Create a Share of Voice Report blog post. 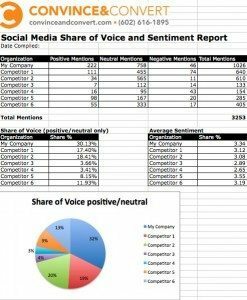 Download Convince and Convert Share of Voice Worksheet (Excel). Building thought leadership through a blog is a fundamental component of many social media strategic plans, especially for B2B. There is a lot of confusion and drama around blogging – and its needless. The 8 Ingredients of Intoxicating Blog Posts Worksheet demystifies the components of an effective blog post, giving your and/or other contributors in your organization a framework upon which to create great content with minimal frustration. The Blog Post Worksheet is accompanied by the blog post about 8 Ingredients of Intoxicating Blog Posts. 32 page eBook chronicling the best interviews from my series of live interviews on Twitter of social media luminaries. Content without strategy is a colossal waste of time and money. You can do better than that, and you need to, as we’re entering an era where low-hanging fruit is an anachronism. When every single one of your competitors has a content marketing program, the advantage will go to whomever has the best understanding of WHY certain content is successful. For every piece of content you create, regardless of format, you should develop a Content Rationale Report that includes these pieces of information. As an example, I’ve included prospective answers for a social media metrics chart I’m developing. You can see them and more information on my post on Why You Should Use a Content Rationale Report. View more documents from Jay Baer.